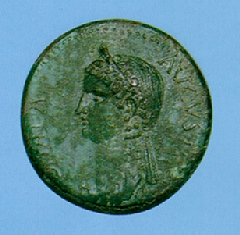 Sabina Poppaea was the second wife of Emperor Nero. She was the daughter of Titus Ollius and granddaughter of the famed proconsul Poppaeus Sabinus. Her mother, of the same name, was reportedly hounded to death by Messalina, the notorious wife of the Emperor Claudius. Poppaea was a woman of striking beauty whose charms and grace were hid from sight by her licentious nature, ambition and an inability to love anyone, according to Tacitus. Poppaea’s first husband was the Prefect of the Praetorian Guard – Rufrius Crispinus. Although she bore him a son, she became adulterously involved with Marcus Otho, who would one day briefly reign as Emperor in the coming Civil War. Accounts of her affair with Otho varied. Suetonius claimed that Otho acted merely as a front for Nero while Tacitus claims that she had been engaged to Otho. Whatever the case, Poppaea left Crispinus, married Otho and soon attracted Nero in 58 AD. Otho’s position as a friend was sacrificed in favor of Poppaea’s role as mistress. Nero appointed Otho the governorship of Hispania Lusitania, a post that he retained until 69 AD, when he would later support Galba against Nero. Poppaea remained behind in Rome with Nero and in 62 AD, Nero divorced his first wife Octavia, who had been barren (daughter of Claudius), and married Poppaea. Octavia was initially sent to Campania and later imprisoned on the island of Pandateria on a false charge of adultery. Finally, Octavia was murdered in 63 AD and her head brought back to Rome as a gift for Poppaea. As Empress, Poppaea was ruthless. Even before her marriage, she pushed for the removal of Nero’s motherAgrippina the Younger and sought to become the sole influence in Nero’s life. She even sat on Nero’s council having equal power with the head of the praetorian guard, Tigellinus. Poppaea was raised to the rank of Augusta in which she exercised power in many ways. On January 21, 63 AD, Poppaea bore Nero a daughter who was named Claudia. The child, however, died four months later. Her passing was commemorated on a single coinage issued of bronze in Syria. During the summer of 65 AD, Poppaea was kicked in the stomach by Nero while she was pregnant. She did not survive and died from internal injuries. Nero’s murder of Poppaea appears to have taken place during a fit of rage and was not premeditated. Nero was later quite distressed and missed her greatly. She was deified and embalmed rather than cremated, which was certainly against Roman custom, perhaps since he could not burn someone who had been so beautiful. 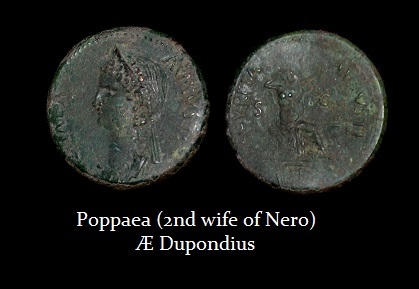 Despite his marriage a year later to Statilia Messalina, Nero became attracted to a young boy named Sporus because his feminine face reminded him of Poppaea. Nero’s reign lasted only briefly thereafter eventually committing suicide in 68 AD. A cruel and devious woman, her physical beauty must have been something to behold. Even her former husband Otho continued to cherish her memory when he became Emperor in 69 AD. Other than the one dupondius pictured here, no other latin origin issues have been discovered. Given the fact that Nero deeply missed his beloved Poppaea, it is not surprising that at least some other denominations may have been struck. However, given the fact that such an issue may have come only months before his downfall, the latin issue of Poppaea may remain as one of the greatest rarities of the Julio-Claudian period. Provisional Mints: Perinthus(*), Nicaea, Thyatira, Magnesia-ad-Sipylum, Smyrna, Ephesus, Laodicea, Ancyra, Acmonea (*), Iconium, Galatia, Antioch, and Alexandria. *NOTE: All but 2 mints (Perinthus & Acmonea) bare portraits of Poppaea with Nero.